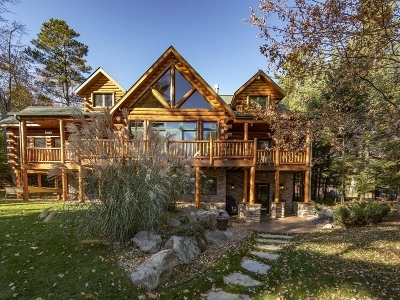 MUSKELLUNGE LAKE MASTERPIECE-STUNNING log-sided home tucked in towering pines w/level frontage on a fully recreational lake! Located between Eagle River & St. Germain, this custom beauty offers; gourmet kitchen w/Sub-Zero/Bosch/Dacor appliances (5 burner gas cook top! 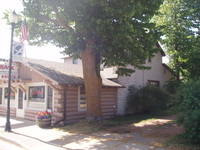 ), cherry cabinetry, granite, & spacious island snack bar. Soaring cedar ceilings accent the massive log walls & the stone gas FP is complimented by cherry flooring. The views from Pella&apos;s finest windows/doors w/interior blinds are spectacular & there&apos;s an unobstructed view from exterior to exterior of the home through the loft that is unsurpassed! More; main floor laundry, master suite w/Jacuzzi tub & walk-in shower, extensive decking & lakeside screen porch. The finished walk-out LL offers a dropped cedar ceiling & expansive wet bar. Professionally landscaped w/flagstone walkways, gorgeous shrubbery & perennials, & fire pit area. 3-car att/heated garage, blacktop drive, stamped concrete accents. EXCEPTIONAL! MUST-SEE!